I’ve mentioned ManPans in a few posts in the past. 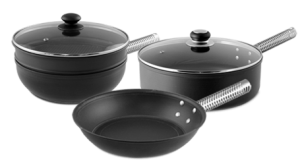 I love promoting ManPans because they are really great cookware and further they are made in my home state of Washington. Well I’m writing an op-ed piece for a local magazine here in Seattle on buying products made by members of our extended American family and am going to be discussing ManPans in the piece. In doing a bit more research on ManPans, I came across a great blog post on cooking with ManPans written by Amanda Formaro of Wisconsin that I thought you might find interesting. After reading the post, you will know exactly how to cook with ManPans. Now all you have to do is go and buy some ManPans. Which is what I encourage you to do. Today. Ok? This entry was posted in american made, cooking, Made in America, made in usa, Washington State Products and tagged Cookware and bakeware, made in america products, Made in the USA, ManPans, Non-stick surface, products made in America, products made in the usa, United States, Washington. Bookmark the permalink.